This unique vehicle is another from the inventory of schw. pz. j�g. Abt. 653. This chassis and hull is clearly that of a Panther Ausf. D., while the turret appears to be from a Panzer IV Ausf. G, H, or J (with the additional side armor). The vehicle was used in the command section of the unit. This vehicle apparently has a rather long history. 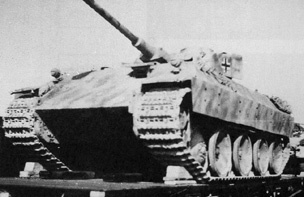 The first modification to the original Panther was conversion to Bergepanther. At some point it was decided to then convert the Bergepanther to a command vehicle. At this point, the Panzer IV turret was added (apparently along with the Panzer IV turret ring to replace the hull top removed to create the Bergepanther).